The King Radisson Campus is located on the north side of King Street West between the Jacques O'Bready (410) highway and Radisson Street. This sector will be largely improved within the next 12 to 24 months and will confirm the major attraction of this part of King St. West. A new complex of 2 buildings with office and commercial space will be built on the current site of the hotel Le Baron (see Complexe Le Baron - project in development). The Hôtel Gouverneur is currently under construction and will be completed during 2015. The complex contains six buildings of about 119,000 square feet of office space and 15,000 of commercial space. Located near several restaurants, grocery stores, pubs/restaurant-bars, banks, pharmacies, gas stations and several other businesses. Interior and exterior parking spaces available for tenants. 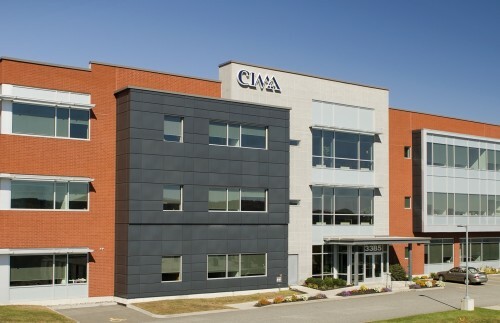 Located on the north side of King Street West between Radisson Street and the Jacques-O’Bready highway (410). Access is easy, either by King St. West where the entrance leads directly to the underground parking lots and by Radissson and La Vérendrye streets where access can be found for exterior parking.